An aphid (a sap sucking insect) excretes sugar water which collects on leaves making nice food for the black fungus that covers the leaves of our Oak trees. While checking the condition of the trees, I came across a ladybird. Surely a good sign, as it was my understanding that all ladybirds were great for managing aphid populations. 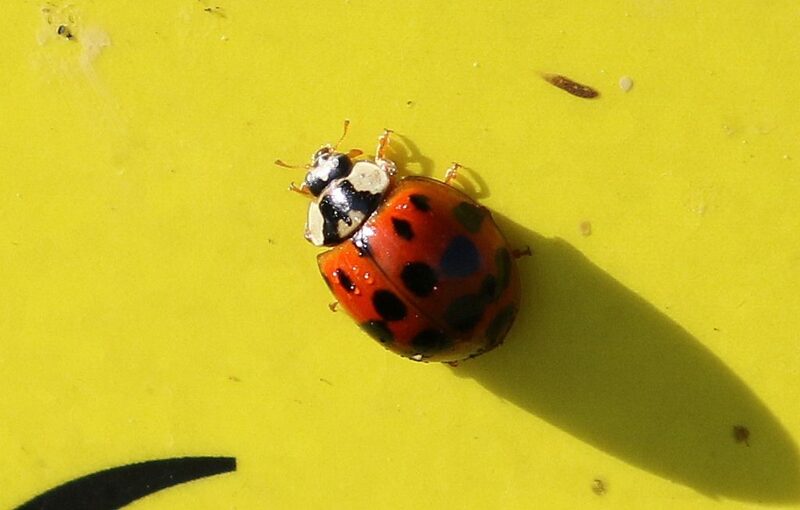 It was only when posting an observation on iSpot (a forum for observations and identifications which connects nature enthusiasts) that I learnt that this particular ladybird was a Harlequin ladybird, a Category 1b species on the National List of Terrestrial Invasive vertebrates. The Harlequin ladybird (Harmonia axyridis) also known as the Asian ladybeetle, is native to central and eastern Asia. It was discovered in the Western Cape in the early 2000’s but has since spread rapidly to all nine provinces in South Africa. The Harlequin ladybird is predatory, and alters or displaces native ladybird species. The Harlequin ladybird can easily be distinguished from our native South African ladybirds by the distinctive ‘M’ or ‘W’ marking on its head. The pattern may be incomplete or form a solid shape and adult beetles can vary in colour from deep red to light yellow. The number and size of the spots on the wing cases can also vary between seasons. After I posted my pictures of the Harlequin ladybird on iSpot, advice came in thick and fast. 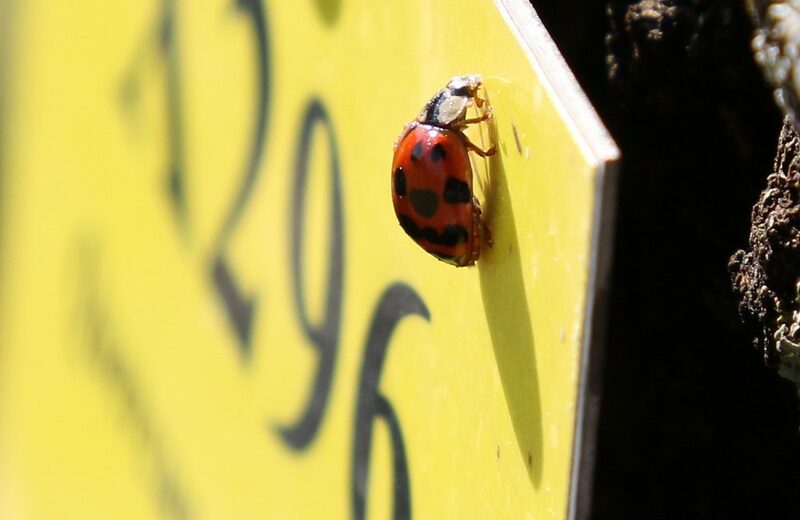 To contribute to an on-going scientific project on the Harlequin, I was to return to the trees and collect at least 10 – 30 ladybirds per site. However, these little ladybirds weren’t in one place waiting for me to collect them. They weren’t at one height either which required a fair bit of scrambling. My fingers were sticky and black. When I was sure I had at least 30, I put them in a clean container, noted the date and site of collection, and returned home and placed them in my freezer. The frozen Harlequin ladybirds were collected by a courier service, and delivered to Dr. Minette Karsten at the Centre for Invasion Biology in Stellenbosch. Four harlequin studies are running in South Africa. The researchers require Harlequin specimens for their DNA and to track their movements across the world and across the country by looking at molecular changes among individuals from a particular site. If you happen to have an oak tree in your garden, look out for the sticky honeydew or sooty mould on the leaves around June; this will indicate the presence of oak aphids (which the nasty Harlequins find most delicious). They are busy finding their mates and finding shelter spots to form aggregations for overwintering. If you notice ladybirds with the distinctive ‘M’ or ‘W’ marking on their heads, they are Harlequins. If you find any, please get in touch with me and do take photographs, if possible. Any specimens you identify will be highly valuable for the researchers in their attempts to uncover the origins, route of invasion and spread of the Harlequin ladybird in South Africa.